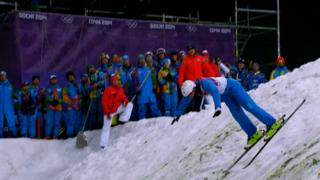 Anton Kushnir wins gold for Belarus with an "incredible" jump in the men's freestyle skiing aerials final at the Sochi Winter Olympics. The 29-year-old's jump scored 134.50, Australia's David Morris won silver with a score of 110.41, while China's Jia Zongyang (95.06) secured bronze. It's a second gold for Belarus in the aerials after Alla Tsuper won gold in the women's event on Friday.